EDITED TO ADD AFTERNOON UPDATE - Some thunderstorms around southeastern Arizona this late afternoon. View of Catalinas above is from 5:40 pm MST and CG flash density below (from weather.graphics and Vaisala) is for 6-hours ending at 5:15 pm. This morning a weak 500 mb cyclone is centered between Tucson and Yuma, while heading southeast into northern Sonora (12 UTC analysis above is from NCAR). Temperatures are around -15 C in the core of this system, and the WRF-NAM forecast from 06 UTC at Atmo (below for 500 mb and valid at 5:00 pm MST) indicates cool temperatures over most of southeastern Arizona this afternoon. The hot and very deep boundary layer will, in conjunction with the cool air above, lead to a chance of high based thunderstorms and lightning strikes over the highest elevations of our part of the state. The forecast from the GEFS indicates a significant ridge and anticyclone centered over the Great Basin for second half of the week - above is ensemble average forecast for 500 mb valid 5:00 pm MST on Friday, June 3rd. This leads to the NWS forecast for the airport grid high temperatures - see below. There have now been two named, albeit weak, tropical storms in the Atlantic Basin before the official start of the season (June 1st) for the basin. Bonnie is again a depression and is just ashore in South Carolina. 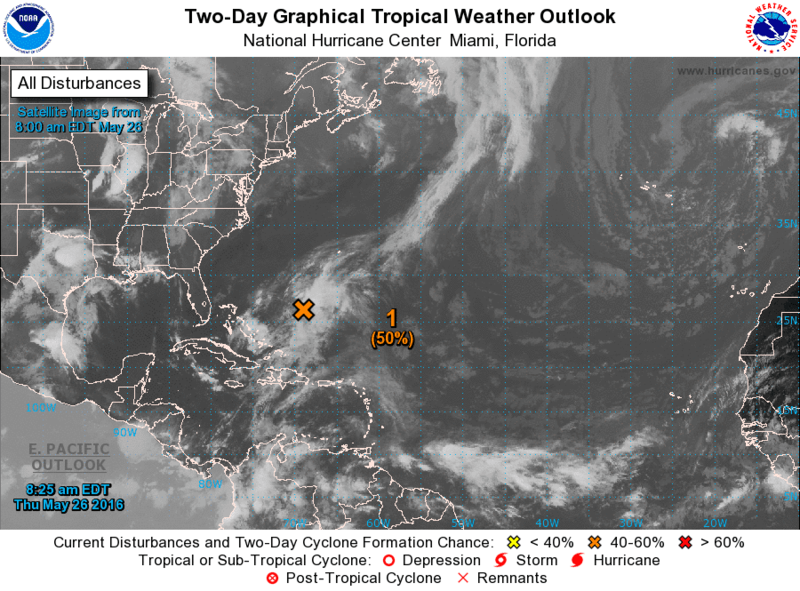 Forecast above from NHC at 8:00 am EDT this morning - Sunday, May 29th. Visible image of Bonnie above is from 1315 UTC and radar with 500 mb winds below is for 12 UTC (from Jack Diebolt). 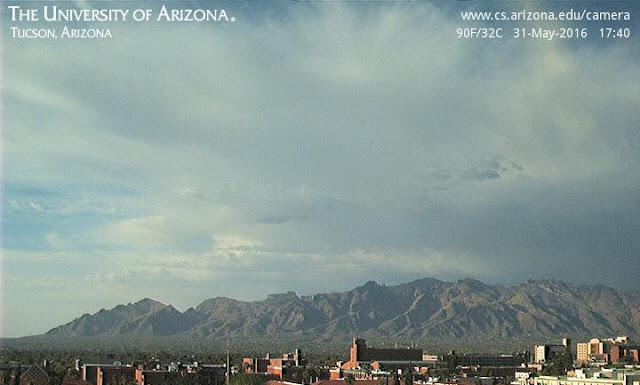 Here in Tucson we continue dry since April 12 and also cool. Mornings have been beautiful for walking, with lows here at house from around 45 to 50 F during the past two weeks. The GEFS plumes for QPF are indicating a chance for sprinkles and spits as June begins (above from 06 UTC). Not much hope there, but for those watching for the first 100+ F day at the airport, the T plumes (below) indicate a rapid heat-up after June 1st. There continues to be various debates online about how NWS computing power and models compare and contrast with those of the ECMWF. However, our massively over-budgeted DoD seems to be working in the computing dark ages, as per a recent report and news stories - below. WASHINGTON (AP) — The government is squandering its technology budget maintaining museum-ready computer systems in critical areas from nuclear weapons to Social Security. They're still using floppy disks at the Pentagon. In a report released Wednesday, nonpartisan congressional investigators found that about three-fourths of the $80 billion budget goes to keep aging technology running, and the increasing cost is shortchanging modernization. The White House has been pushing to replace workhorse systems that date back more than 50 years in some cases. But the government is expected to spend $7 billion less on modernization in 2017 than in 2010, said the Government Accountability Office. "Clearly, there are billions wasted," GAO information technology expert David Powner told the House Oversight and Government Reform Committee at a hearing. Although lawmakers of both parties say they are frustrated, it's unclear whether Congress will act. Part of the problem is finding money to invest in a transition to new systems at agencies across the government. — The Defense Department's Strategic Automated Command and Control System, which is used to send and receive emergency action messages to U.S. nuclear forces. The system is running on a 1970s IBM computing platform, and still uses 8-inch floppy disks to store data. "Replacement parts for the system are difficult to find because they are now obsolete," GAO said. The Pentagon told GAO it is initiating a full replacement and the floppy disks should be gone by the end of next year. The entire upgrade will take longer. 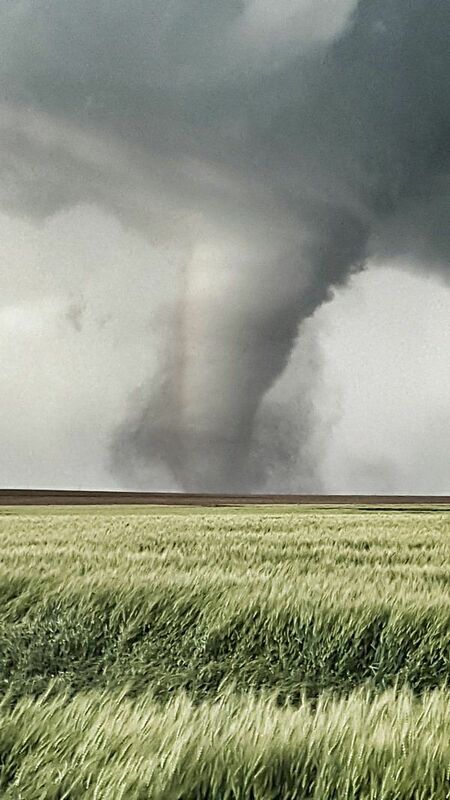 Large tornado west of Dodge City, Kansas, yesterday afternoon. There were many tornadoes observed during the afternoon and evening, with multiple tornadoes observed at some times. There are many many photos and videos on the internet, indicating a severe convergence of storm chasers into the region.  The images shown here are mostly from Jack Diebolt, who uses private sector analysis software (GRAnalyst) to plot/analyze radar and other data in near real-time. The image above shows the small storm near Meade at 2127 UTC (4:27 pm CDT) that will develop into the supercell that moves north toward Dodge City. The supercell near Scott City was also producing tornadoes. There are a number of boundaries at low-levels interacting with the storms. One of these was the dryline but others were from prior or ongoing convection. The visible satellite image below is from about 2130 and also has plots of surface dewpoints. Much more dense surface observations would be needed to sort out the boundaries and their character. These two reflectivity images are only 13 minutes apart - top is from 2255 and bottom is from 2308 UTC - the magenta line outlines the tornado warning issued from NWS DDC and blue line is apparently old severe thunderstorm warning that is being superseded. 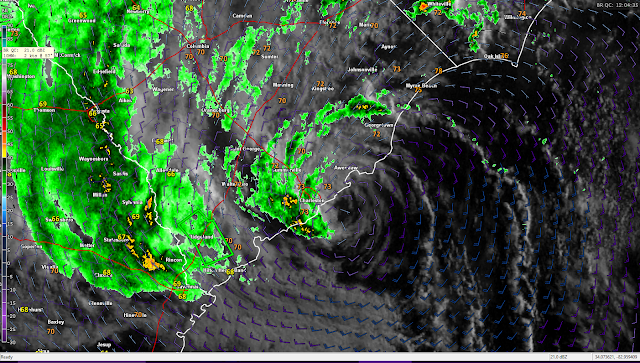 The image above shows the low-level mesocyclone (with a tornado) spinning and interacting with two boundaries. The 1st tilt radar beam is apparently scanning below the precipitation free, updraft base, so that there is only weak echo present. However, by the time of the image below a hook echo is present with a very distinct tornado debris-ball echo associated with the tornado. The final two images here are from 2322 (above) and 0002 UTC (below, from NWS DDC). The supercell was apparently a left-mover and that allowed the tornadoes to skirt past Dodge City to the west. The larger view image below continues to indicate complex interactions between a number of boundaries and supercell thunderstorms. Certainly an interesting and very complicated event. Above and below are today's and tomorrow's fire weather outlooks from SPC. This afternoon winds are gusting well over 30 mph in parts of southeastern Arizona, especially Cochise County, while RH has dropped below 10 percent. Looks like more of the same tomorrow, with the WRF runs at Atmo indicating even stronger winds. Visible satellite image at bottom shows our clear, dry skies at 2:00 pm MST this afternoon. Art Douglas has shared his analog-produced summer outlook for JJA 2016 - above is the analog 700 mb pattern (his analog years are noted on the charts). His comments on the 700 mb pattern are below. The resulting anomalies in temperature (above) and precipitation (below) are very grim indeed for the Southwest. The corresponding, but not at all similar, outlooks from NWS CPC are shown further below. Art notes that: ... the "coin flip" comment [in my earlier post] on NOAA's summer forecast here has some hidden info........basically NCEP has no clue as to what will happen and a coin flip says equal chances above or below. There are times two competing signals end up with above or below normal forecasts and thus they cancel each other. In this case I don't see competing signals cancelling each other and giving equal chances, rather NOAA has no clue. Splitting hairs, I know! The dust situation along I-10 has been aggravated this spring by investors buying up land in Cochise County to plant new orchards - almonds, pecans, and pistachios. The non-resident owners are mostly from California and the Middle East, but the culprit in the recent wrecks is from Phoenix. 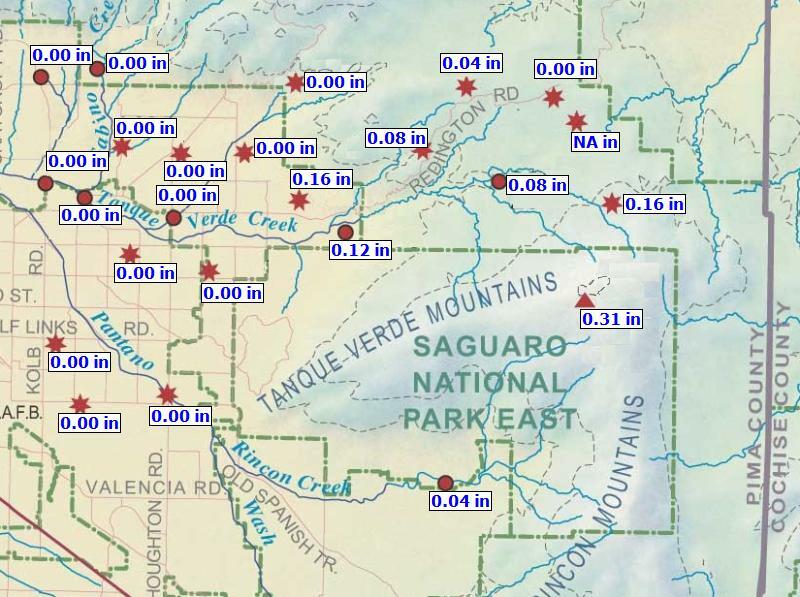 There is little in the way of restrictions in Cochise County, making it a target have investors who have been impacted in California. As for the mega-corp Nestle coming to bottle City of Phoenix water, my mind just boggles. I'm sure it won't say on the labels that you're drinking CAP water from the Colorado River. Quite a contrast with the situation in Oregon, where Hood County voters have just invalidated an agreement between Nestle and Hood River that would have brought a similar plant to that city. Ironic that water seems more valued in Oregon than Arizona. Here are some current outlooks (plus a forecast from their CFSv2 model) from NWS Climate Prediction Center (CPC). I show these for general interest, since the track record for the CPC outlooks for the Winter and Spring have not inspired much confidence in their products. Graphic above is for JJA temperature. Even though it continues unusually cool in the Southwest, the Summer outlook is for a switch to above normal temperatures. Graphic below is for Summer precipitation and indicates a coin flip is appropriate for most of the country. This too seems a switch for the Southwest, since much of the region has been very dry most of 2016. The Summer forecast above is from the center's CFSv2 numerical forecast model and is for precipitation. The output from the model appears not to carry much weight in the final outlooks issued by CPC. Finally, graphic below is for JAS, since June doesn't mean much here in the Southwest. Interesting that the outlook is very much different than the Summer one above. The wetness in the Summer forecasts occurs principally in June, while September shifts wetness to the Southeast and returns dryness to the Northwest, while nothing changes much in the Southwest. There were thunderstorms around yesterday but these were mainly to our north and east, as the high-resolution WRF forecasts from Atmo had indicated. There were two ALERT sites that measured rainfall but amounts were quite light. Below are some CG flash graphics from various sources. The displays above and below are from a new (to me) site that Art Douglas steered me to at blitzortung.org in Germany. The display above is a "save as" graphic and it has lost its state boundaries. Below is a screen snip of the southern portion of the display - these data are detected flashes for two hours ending at 2355 UTC yesterday afternoon. The real time displays from this organization (apparently all open access - which is a breath of fresh air) are quite amazing. I am not sure how their detection systems work and will have to dig deeper. However, this will be a very interesting site to monitor once the summer thunderstorm season gets going down here. For contrast the 24-hour display above is from Atmo and Vaisala for period ending at 0803 UTC today and below from weather.graphics is flash density for 24-hours ending at 1345 UTC this morning. All systems and displays show the isolated thunderstorm location to our south on the northwestern slopes of the Santa Rita Mountains. 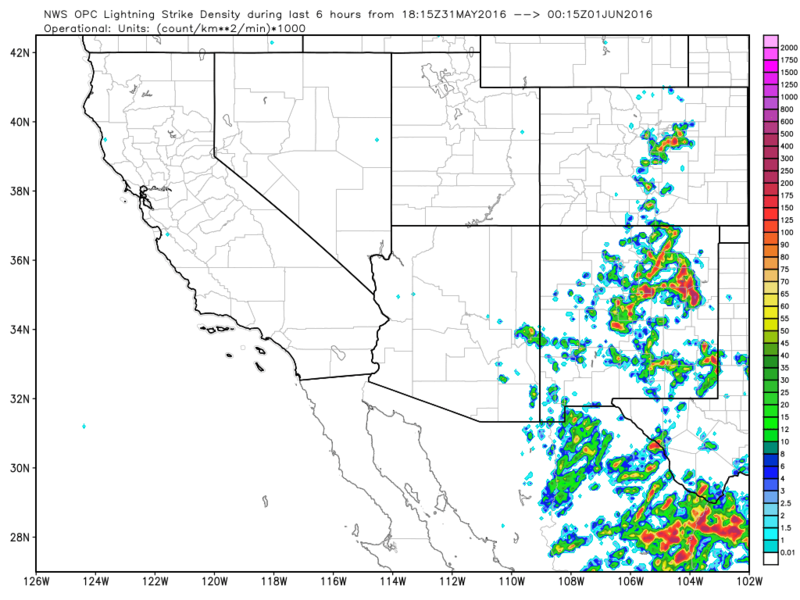 It was an active afternoon yesterday across much of the Southwest with fairly widespread thunderstorm activity.  Above graphic shows CG flash density for 24-hours from weather.graphics and Vaisala. 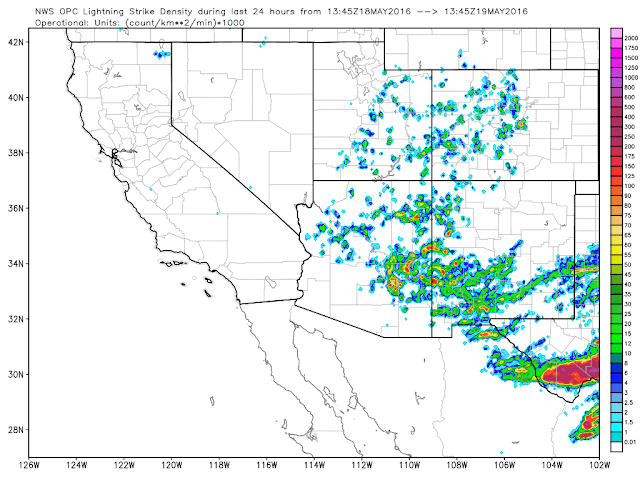 Composite radar image below is from the Yuma radar at 4:30 pm MST yesterday afternoon. Here in the Tucson area this morning humidity is noticeably higher and there are some moderate cu around from west to northwest. The morning skew-T plot for the TWC 12 UTC sounding above (from SPC) indicates a fair amount of CAPE present. The profile is excellent for supporting active thunderstorms, since the bulk of the CAPE is present in the layer with temperatures of -10 to -25C. The 06 UTC runs of the WRF model at Atmo tend to keep most of the storms around flanks of Catalinas and to the north and east. 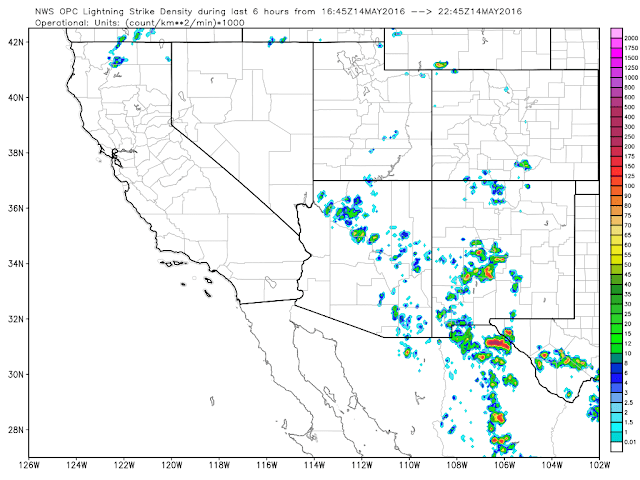 Both the NAM and GFS variants forecast only isolated thunderstorm over parts of Pima County. Current NWS grid forecast for airport indicates 30 % chance of precipitation and that for the grid up at Oracle indicates 40 %. Regardless, it should be an interesting day. The GEFS plumes for QPF from 06 UTC are indicating a chance for rainfall at TUS this evening into tomorrow, as another 500 mb closed low comes by. The amounts are very light, but 70 % of the members are forecasting 0.01" or a bit more. Both versions of the WRF model also forecast isolated showers around central and eastern Pima County, with chances for some of these to become thunderstorms. 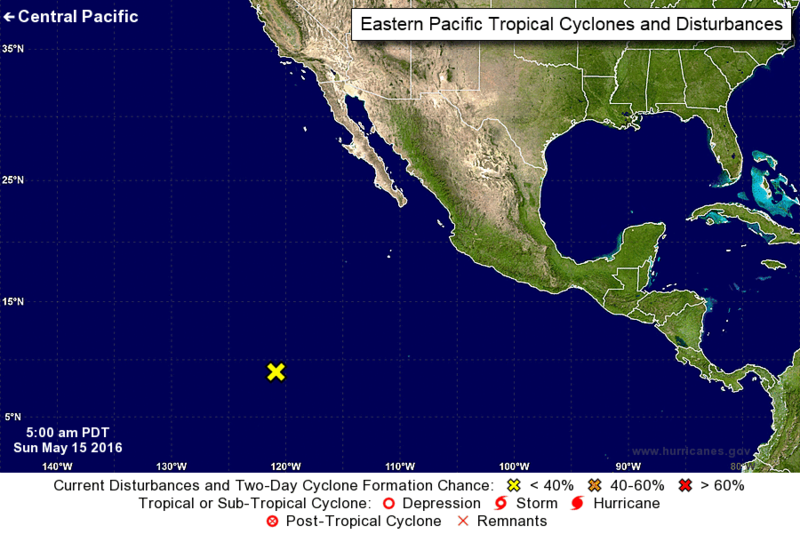 Today marks the start of the 2016 Hurricane Season in the Eastern North Pacific Basin and NHC has begun issuing its daily outlooks . 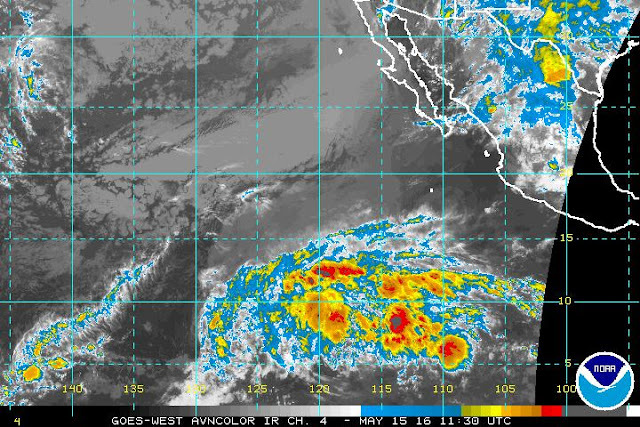 Above IR image shows quite a bit of activity in the Basin this morning, and first NHC outlook for the season is below. 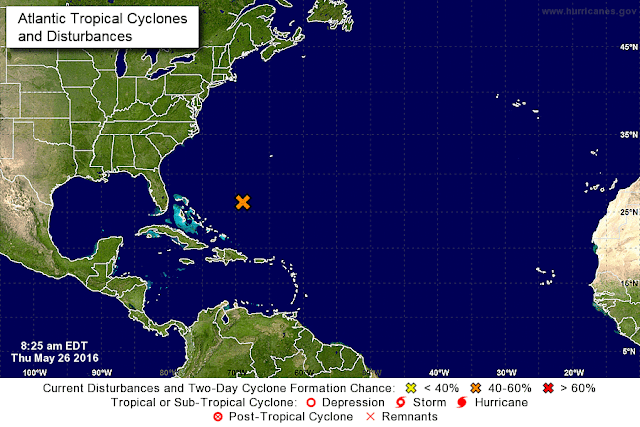 The first six named storms this year will be: Agatha; Blas; Celia; Darby; Estelle; and Frank. There were thunderstorms in the eastern edge of the ALERT network yesterday afternoon and 10 sites recorded measurable precipitation. 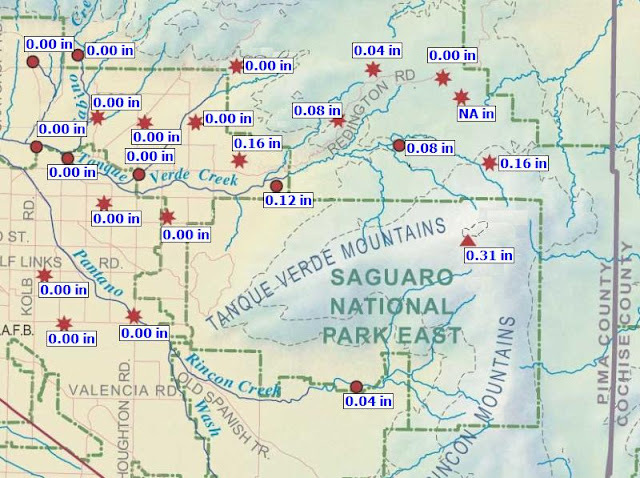 Eight of these are shown in eastern sector map below - max was 0.31 inches at Manning Camp and the rainfall extended south from Redington Pass to the Empire Mountains just south of I-10. Dry here at house with our last measurable rain back on April 12th. Thunderstorms occurring across Arizona and New Mexico this afternoon, pretty much as forecast by the WRF models at Atmo the last two days. Graphic above (from weather,graphics and Vaisala) shows CG flash density for the past 6-hours ending at 3:45 pm MST. While composite radar displays below are from about 1:00 pm and 3:00 pm. A storm just northwest of here left us with a smell of rain in the air and that's about as good as it is likely to get here at the house from this little burst of activity.